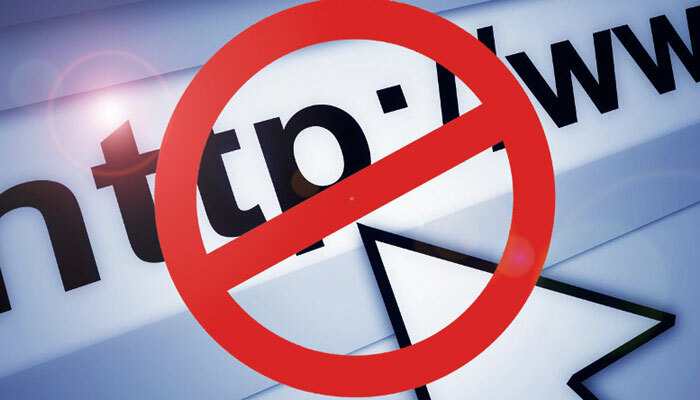 KARACHI: In random tests involving 22 internet service providers (ISPs) it has been found that more than 200 URLs have been blocked in Pakistan, according to a research study carried out by the Open Observatory of Network Interference (OONI) and Bytes for All Pakistan. The research report released on Wednesday looked at data from 2014 to 2017 and confirmed detection of 210 URLs in the country that were blocked by 22 ISPs. Several tests, including the HTTP Invalid Request Line and header field manipulation and Vanilla Tor, were carried out to confirm the detection of blocked URLs. The research study is part of an ongoing effort to look at internet censorship in Pakistan and more than 200 other countries around the world. The OONI and Bytes for All Pakistan collaborated on the project to examine internet censorship in the country through collection and analysis of network measurements. “Explicit blockpages were observed for many of these URLs, while others were blocked by means of DNS tampering,” said the report. “Many of the blocked URLs were considered blasphemous under the Pakistan Penal Code for hosting content related to the controversial ‘Draw [Prophet] Muhammad Day’ campaign. Geopolitical power dynamics appear to be reinforced through the blocking of sites run by ethnic minority groups,” it added. According to one of the report’s authors, Haroon Baloch, the findings generally highlighted political dissent in the country since 2014. “In Pakistan, it [the situation] has worsened since January 2017 — after the disappearance of the bloggers,” he added. Discussing how pages and sites were blocked, Mr Baloch said that people could report an objectionable page or link directly to the Pakistan Telecommunication Authority (PTA) by going to their website, while the PTA could approach ISPs to block a page directly or by tampering with the DNS. The report claimed that local ISPs appeared to be applying “smart filters”, selectively blocking access to specific web pages hosted on the unencrypted HTTP version of sites, rather than blocking access to entire domains. It said that overall they found ISPs to be blocking the HTTP version of sites, potentially enabling censorship circumvention over HTTPS (for sites that support encrypted HTTPS connections). “On a positive note, popular communications apps, including WhatsApp and Facebook Messenger, were accessible during the testing period. We find that the Tor network, which enables its users to browse the web anonymously, was mostly accessible,” the report added. Nighat Dad of the Digital Rights Foundation said: “The filtration technology has been there for a while in Pakistan and I think back in 2011 or 2012 there was a report on Pakistan’s internet exchange gateway and they learnt about the filtration method and how to block websites — it has always been there. It doesn’t come as a surprise that 210 URLs were blocked. Talking about censorship in the country, Ms Dad claimed that the prevention of electronic crimes act had made it easier to ban/censor pages and websites. “It was not valid to censor or ban content before the law. If you read the clauses of the law, they clearly state that anything that hurts national security, armed forces or religion can be censored,” she said, adding that the process of blocking or censoring the content was not transparent.